I recently was on a project for a client that needed a marketing-style single page site. They wanted scroll tracking so that as the user scrolls the section they are currently on would be highlighted in the sticky header. “Alright, easy enough,” I thought. So I boldly went down the easiest path of scroll tracking in Vue. I decided that the header should attach event listeners for when the user scrolls. And since the header knows about the anchor links it’s linked to, it can just look to see what’s in the viewport and highlight that link. See the Pen Vue scroll tracking (1) by Jim Schofield (@oldcoyote) on CodePen. See the Pen Vue scroll tracking (2) by Jim Schofield (@oldcoyote) on CodePen. So what’s a coder to do? So here’s what we could do instead: how about we keep an array of blocks that are on the page and always select the element that comes first? That way, when block one starts to go off screen, the first array element will just be block 2! Perfect! See the Pen Vue scroll tracking (3) by Jim Schofield (@oldcoyote) on CodePen. Do you see the issue now? It’s like putting carpet in a room when there’s not enough square feet of carpet! Fix one corner and the others are messed up. We now never see an active state for block 6! So a cheap workaround is to add a footer, or extra space below the block, so that you can scroll long enough until block 5 is out of the picture. But there are more problems. 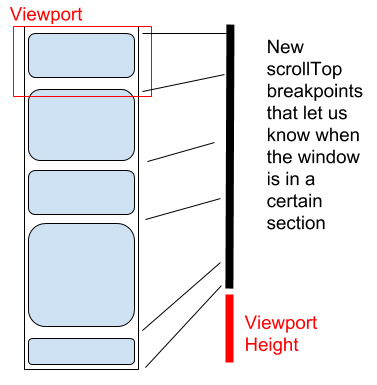 What if any of the blocks are taller than the viewport? See the Pen Vue scroll tracking (4) by Jim Schofield (@oldcoyote) on CodePen. Only elements small enough get recognized! But all is not lost! It is simply that our elementInViewport function is too strict. It’s expecting our element to be both above the bottom of the viewport and below the top. For an element that’s taller than the viewport that can’t happen. Here are our current “in viewport” possibilities. I’ve xed out the ones I now think are “not in the viewport”. We want to exclude when a block is outside of the viewport. See the Pen Vue scroll tracking (5) by Jim Schofield (@oldcoyote) on CodePen. Heck yes! It’s working. But there’s still an issue. Can you catch it? Alright… so if block 6 is much smaller, it’s never going to be recognized. Actually, because it’s so much smaller, sometimes 5 isn’t even recognized! See the Pen Vue scroll tracking (6) by Jim Schofield (@oldcoyote) on CodePen. This is about when I started to lose all hope. See the Pen Vue scroll tracking (7) by Jim Schofield (@oldcoyote) on CodePen. I adjust the rules about how far in to the viewport the element has to be. It works relatively good, but it makes me nervous. There is still something deeply unsatisfying about this. What other options do we have besides tweaking these viewport rules? A caveat before I go into this method: I still haven’t found a bulletproof method for this. I just think this API is really interesting and it offloads work so you’re not tying up the main thread. Also, support for intersectionObserver is not great, but it was good enough for my client’s requirements for browser support. See the Pen Vue scroll tracking (8) by Jim Schofield (@oldcoyote) on CodePen. Yeah, it does. Our function is called every time an element is either 50% in the viewport or 50% out of the viewport. So if we just always set the first entry to be active, it will jump around as a we scroll. If you think about it, each scrollTop of each un-transformed block will shrink by the proportion that the viewport height takes up on the document height. See the Pen Vue scroll tracking (9) by Jim Schofield (@oldcoyote) on CodePen. It works…. better… ? That’s as far as I got for trying to accurately track what blocks are on screen. So, this was showing a couple ways to do scroll tracking inside of a Vue component. Am I missing some easy way to do this? Am I way off base? Let me know @jschof or in the comments. I also ran into a bunnnnnch of other gotchas while developing a psuedo-cms. That, my friends, will be our next post.